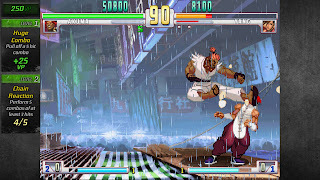 During its first release Street Fighter III: 3rd Strike hasn’t had as much success as its predecessor, however it was still regarded as a great fighting game. Refined with new features, it has come back bigger and better. 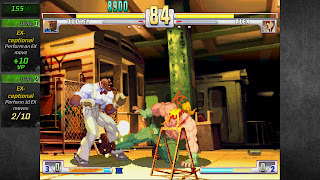 3rd Strike Online is a perfect port of the arcade version of the game without any updates added to the characters and was aimed at the fans of the original title. The parry system is the signature mechanic in the game and cancels out the opponent’s move. To parry you have to time the opponents attack and press forward or down (depending if they're attacking high or low) to parry their move. Don't even need to use my hands! 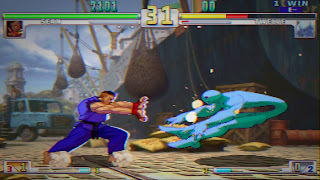 Just like any other fighting game there is an Arcade mode where you go through a series of battles until finally reaching the boss but for newcomers, it might take you more than a few tries getting there. Just a fair warning though, button mashing will not help! The key to combos is timing and the window for said combos are tiny compared to Street Fighter IV. Also for newcomers to 3rd Strike, there are training and trial modes for you to get better, something that was definitely not available in the original and in all fairness it gives newbie’s a chance to hone their skills before actually entering the ring. Trial mode is broken into three categories: Parry, Handicap and Character trials. Parry trials help the player get used to the parrying system and it ranges from easy to hard difficulty; among the trials is the infamous EVO #37 moment. If you don’t know this moment, it's a must watch! The Handicap trial is where the player plays with a reduced life ranging from 75% to having no health at all. And Character trials help the player learn all the important moves and combos to get an understanding of all the characters. The training mode comes in two forms; normal and parry. In normal you can practice against a dummy using whatever settings you want to build your strategies on, even fighting against an AI on any difficulty. In parry training mode you can set the 2nd player’s actions and parry those moves as the 1st player. This is a great feature, which will help improve your skills and learn new and effective strategies. A boxer only punches, so I'll kick you to death! When you complete some of the challenges e.g. parry 25 attacks you get rewarded with Vault Points, which can be used to unlock artwork both official and fan made, remixed music tracks and classic videos of the characters endings. The game has done a lot to expand upon what was already strong gameplay mechanics however one thing that may bring the game down is its steep learning curve; you would need to put in a lot of hours to be become pretty decent at the game and to be honest it makes Street Fighter IV feel easy to play in comparison. There are 3 ways to play online whether it’s a Ranked Match for the competitive player or, Player Match just to play someone for fun or the tournament mode that allows up to 8 players. Ranked matches are pretty fast as it searches for an opponent of a similar level and pairs you up for example; if you’re on rank 1 it will pair you with another rank 1 player. The Player Match lobby is quite similar to SSFIV’s Endless Battle lobby as there are several slots open depending on how many the host has created. The players that are waiting for their turn get to watch the match between the two that are fighting. Tournament mode has basic knockout rules with the winner being the person that won all their matches. There is an option to save your replays after completing a match which you can then upload to YouTube for the world to see. The visuals have improved a lot keeping the same style as the original game but redrawing them for high definition. The game has received a visual makeover with some of the artwork exhibited while in the menu. 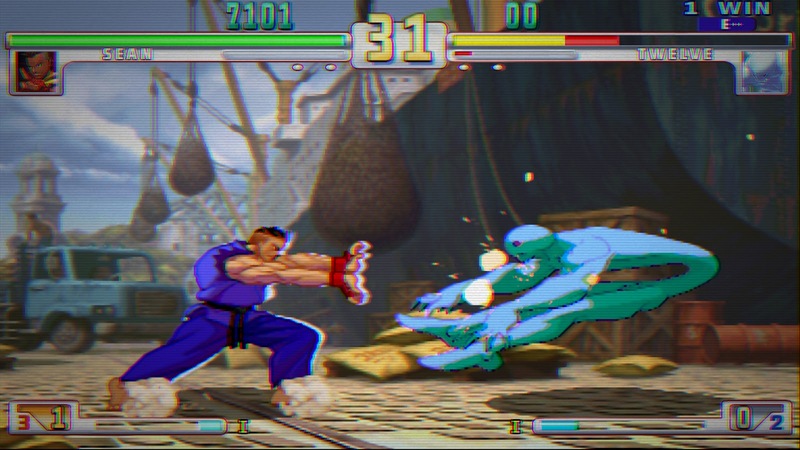 There are different viewing options: from normal 4:3 to widescreen to even the original arcade cabinet style, filters and even scan lines to make arcade players feel at home. The sprite animation seems to be a bit more blurry when on the smooth filter. The crisp setting however is a better choice when playing. Scan lines for the true arcade experience. If you’ve missed out on playing the original version, Street Fighter III: 3rd Strike Online Edition will offer you the exact gameplay with better visuals and fluid animations. It is in my opinion one of the best fighting games and I urge all the gamers, not only fighting fans to try this game out.